Home » GRADE LEVELS » 6th Grade » Math Lesson ~ Bundle of Fun with INTEGERS! Math Lesson ~ Bundle of Fun with INTEGERS! Have Fun & Engage Students on Positive & Negative Integers! 3 Methods of working with Operations of Integers are Included – the number line method, visual method, & algorithm method. Perfect to differentiate and teach operations with Integers! with this packet of activities! Learn more about this bundle here….. 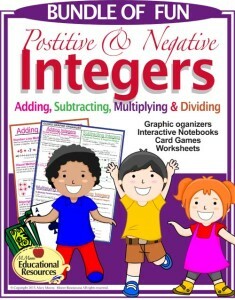 Positive & Negative Integer Bundle of Fun! You may share, pin, like, & repin.